Review: In The Ball Hogs, Ben is on a soccer team and is determined to win. But when ball-hog Mark stands in the way, will Ben’s team have a chance? 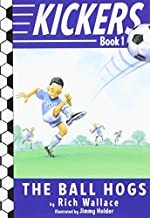 The Ball Hogs the first book in an early-reader series, Kickers written by Rich Wallace. Ben joins a soccer team in his town and finds it is super fun until Mark comes along. Mark is tall and fast and brags a lot. Ben wants to prove to himself and the team he can be a better player. But then Mark and Ben aren’t getting along at school either. Playing four-square used to be fun until Ben had to make a new team. But then Ben learns that he needs to stop being a ball hog too. Will Ben learn to pass and learn to start getting along with Mark? I guess you’ll have to pick up the book to find out. The Ball Hogs is a good book. It uses descriptive details and it seems like a real life situation. The solution is good and fair. This book is intended for younger readers, probably kids from second grade through fourth grade. It fits early readers because not a lot of big words are used, and the font size is big. I think the author did a good job with this book. He based some of things that happened on his own experiences of when he coached his son’s kindergarten soccer team. All in all it was a good book and I enjoyed it very much. We would like to thank Random House for providing a copy of The Ball Hogs for this review. Have you read The Ball Hogs? How would you rate it?